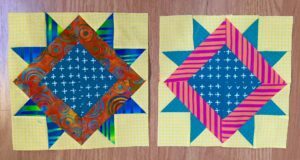 I made these two Night and Light blocks for April. I hope they meet the requirements, the background is yellow but the interior is not totally scrappy. If they are not scrappy enough, let me know and I’ll keep them for another project. Since there are quite a few seams in the piece, my advice to sewers is to use a scant 1/4 seam and follow the directions which say to measure each completed unit. I think the block is lovely and I hope I get time to make more this month. So you used large scraps – they’re fine.